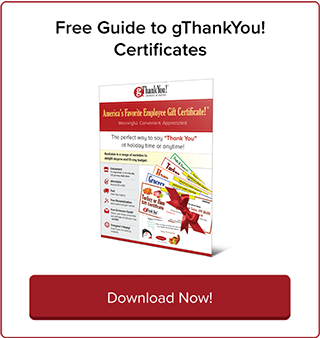 Why Give Employees a Thanksgiving Turkey | gThankYou! A turkey gift is a workplace holiday tradition going back generations. Historians date the employee turkey gift tradition to the manufacturing boom of the 1800s as a way to introduce immigrant workers to American culture and the holiday spirit of Thanksgiving. Why does the employee turkey gift tradition still have staying power? Your employees are craving your thanks — and not in the form of cash or bonuses, according to Gallup research. The poll of U.S. workers also reveals only one in three say they’re regularly recognized. A holiday turkey gift shows you care and are grateful for employees’ hard work and dedication to the success of your business. We associate turkey with Thanksgiving and gratitude. In the midst of the hectic holiday season, we gather with family and friends around a turkey to give thanks and appreciate one another. Turkeys are native to North America — and the centerpiece to America’s oldest tradition, Thanksgiving. By the time President Abraham Lincoln declared Thanksgiving a national holiday in 1863, to count “blessings of fruitful fields and healthful skies,” Americans had already been celebrating Thanksgiving for two centuries. Sharing the gift of a holiday turkey, personally, with a big smile, warm handshake and hearty “Thank You” is a priceless opportunity for managers to make employees feel valued and appreciated. A turkey evokes the joy of the holidays and a lifetime of family memories. The aroma of roasting turkey reminds us of childhood visits to faraway relatives. It takes us back to grandma’s kitchen: watching multiple generations laugh together as they prepare the feast, sitting at the “kids’ table” with our cousins and, of course, the great feeling of being surrounded by loved ones. Americans eat 46 million turkeys on Thanksgiving, but the joy of roast turkey isn’t reserved for Thanksgiving. We also eat 22 million turkeys on Christmas and 19 million on Easter! The Thanksgiving tradition knows no religious, ethnic or class boundaries — all Americans love celebrating Thanksgiving with a turkey centerpiece. Your employees will appreciate being able to share their turkey gift with family and friends. A turkey meal unites generations and brings together family, friends and neighbors. Turkeys embody the grateful spirit of the season, and that includes your company’s gratitude. When your employees sit down to enjoy their turkey, your company and your appreciation will be on their minds. A turkey gift is a gift employees can actually use. And it’s one of the most meaningful yet cost-effective ways to thank employees. Here at gThankYou, we’ve perfected the art of the Thanksgiving turkey gift so it’s easy for you and convenient for recipients. That’s why gThankYou! 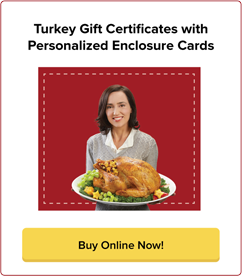 Turkey Gift Certificates are America’s favorite Thanksgiving turkey gift for employees! gThankYou! 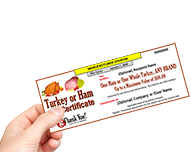 Turkey Gift Certificates can be redeemed for any brand and any preparation of whole turkey at virtually any major grocery store in the U.S.
We offer Certificate personalization and customizable “Thank You” Enclosure Cards – all FREE with any purchase. Virtually all orders ship the same day, meaning you can have them as soon as the next business day. That way you can focus on what’s really important: sharing your gratitude with employees!